This is a beautiful post by Paul Zalonski brought to you by the Communio web blog. Thought everyone should have a chance to enjoy it. 1. Let us totally consecrate ourselves to the Immaculate, in order that she may deign to use us as instruments to save and sanctify souls. Let us conquer hearts for her, because wherever she enters, there also penetrates divine grace and from this follows salvation and sanctification (SK, 164). 2. Be calm, love one another, bearing with one another’s defects, so that your interior serenity may draw the souls of the pagans [unbelievers] to the Immaculate. In fact, with the help of the Immaculate, not only can we do all things, but we can also endure all things (SK, 678). No Christian can claim to be such without following Mary’s lead to Christ! 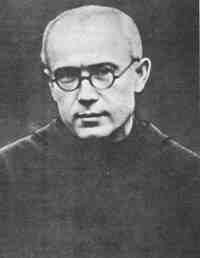 Saint Maximillian learned from the school of Mary how to be integrated human being, a better priest and to be as Pope John Paul said of him, a martyr of charity. Raymond Kolbe was born January 8, 1894. In 1910, called by the Holy Spirit, he gained entrance to the Conventual Franciscans where he took the religious name “Maximillian”; besides formation in Poland, he studied in Rome and was ordained priest in 1918. Under the Nazi ideology Kolbe was sent to Auschwitz where he eventually gave up his life for a fellow prisoner on August 14, 1941. Father Maxmillian’s advanced the Kingdom of God by centering his work around a devotion to the Virgin Mother of God and evangelization projects. In 1917, a year prior to his ordination, he established a Marian movement whose members consecrate themselves to the Immaculate Heart of Mary. The movement continues today known as the Militia of the Immaculate. By 1927, Kolbe founded the City of the Immaculata, a center of evangelization near Warsaw, where contemporary instruments of communication were utilized to produce and distribute catechetical and devotional materials; the friars had a daily newspaper with a circulation of 230,000 and a radio program. Records show that in 1939 center numbered 650 friars working to share the gospel with the world. Historians of theology say that Saint Maximillian Kolbe’s Marian theology pre-dated the Vatican II teachings on the Blessed Virgin, namely, he spoke of Mary as a mediatrix and advocate of all the graces that the Most Holy Trinity uses for our salvation.